Once a mainstay for selling classic Italian goods and authentic artisan products, the quality has deteriorated and been replaced by cheap knickknacks. The court upheld a ruling by the Tuscan regional administrative court (TAR) and rejected the appeal filed by street traders. The area in Florence takes its name from the richly adorned San Lorenzo church, and is home to the iconic Medici chapels decorated by Michelangelo. Indeed, for centuries the zone has been known for its market trade, especially in leather goods. In an official statement, the Council of State announced "because of the general degradation of the market, its traditional character had been lost, as well as the balance with the context of the precious city of art, which ended up being damaged." For fellow foodies, there is still good news. While the outside carts will be shut down, the indoor food market will continue to be open in the morning hours. It is still worthwhile to visit the San Lorenzo Food market, where the second floor has been renovated into a cooking school and other shops selling local products. While this may come as bad news for some, it upholds the integrity of the government’s commitment to maintaining authentic and well-crafted goods. When planning your next trip to Italy, contact the Italian Concierge to craft an authentic, luxurious Italian experience. 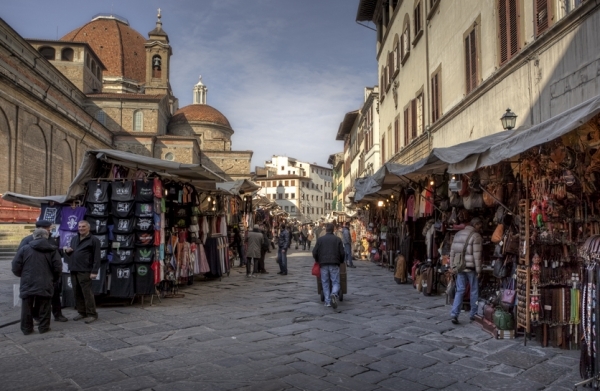 When looking for the best Italian travel agency, contact Joyce Falcone- The Italian Concierge to help you plan an unforgettable stay in Florence and explore the hilltop villages and medieval hamlets of Tuscany. Whether you plan to stay in Florence for several nights, or just passing through during your trip to Tuscany, contact your personal Italian travel agent for the best of all things Italy.